Without a doubt personal relationships are the most effective way to share the gospel in a meaningful way. I’ve had deeply personal conversations with strangers, and have led strangers to Christ. But those conversations were the results of months of spiritual preparation by their friends who were already speaking into their life – I just happened to be a confirming piece of information they were looking for. Statistics in various studies have shown that the verbal and life witness seen through personal relationships with genuine Christians are what lead to new believers. The results revealed that, indeed, individuals were influenced to commit their lives to Jesus by people who modeled Jesus in their lives. 4 Reasons that Relational Evangelism Works. As I thought about this, here are 4 reasons why relationships are important in personal evangelism. From reading unChristian, the Church as an institution doesn’t have a lot of credibility. Your friend might even have a crazy relative or obnoxious friend who is always forcing a Jesus-conversation upon them. For your friend to become a Christian, they need a credible witness: someone who is normal. Your friend trusts you and your ideas, even if they don’t agree with you. You’ve built respect in your relationship and that fosters the positive credibility to be a person of influence. Growth step: In which relationships with non-Christians do you need to improve credibility? What can you do this week to change that? Over time, people can see what defines your life. Your interests, hobbies, and choices, plus how you respond to circumstances, are visible to your friend. what I’m learning from my devotional life with God. knowing the presence of God’s peace in the midst of our challenges. Giving $$ to mission projects that advance the gospel. Godly ways I raise my children as I get wisdom from God’s word. Giving vacation time to foreign missions with my family instead of a week at the beach. I am comfortable in expressing the spiritual side of my life: my walk with Christ. People hear that I walk with God. They hear current stories of what God is doing in my life. Growth Step: Can you talk about your spiritual life with Christ? What story God’s activity in your life can you share with a friend? When strangers interrupt our life with some agenda they are pushing, we are naturally defensive. But in your relationships, you’ve got access to speak to deep places. You’ve got access to hearing their needs, hopes, desires and struggles. They call on you when life throws them a curve ball. They might share with you how they face financial ruin. They might share with you how they are headed towards divorce. In the safety of credible relationships, you’ve got access to their deepest needs when they come to the surface. You’ve got access when they start to talk about their spiritual thirst. Very rarely will a stranger get that level of access. Growth Step: What steps can you take this week to deepen your relationships with non-Christians? Within the safety of a trusted relationship you have earned the right to speak freely about faith. You’ll have earned the right to speak about your friend’s faith. You’ll have earned the right to speak to their spiritual thirst when you hear it. And this conversation may not be just at one time, but over the course of several conversations spread out over time. The people that I have most influenced for the kingdom of God are people who allowed me to speak into their life over a season of time. I’ve been able to ask about their beliefs, talk intelligently about them, and even disagree without being obnoxious about it. 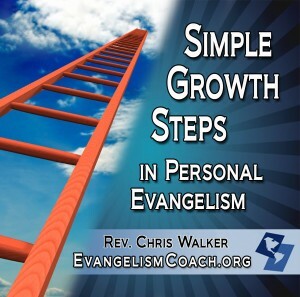 Growth step: Have you heard your friend speak about their spiritual restlessness? Pray that the Lord gives you a chance to speak into that. You will need some kind of MP3 player on your computer to listen to this file. Availability: Instantly after purchase. Get your download here. when i encountered this website, i asked myself “where have you been?” without reservation, this is the best thing that has happened to me as far as creating a more hospitable church, training materials for my church members and personal evangelism is concerned. thank you and may God continue to strengthen you hands and anoint you the more for this generation and beyond.